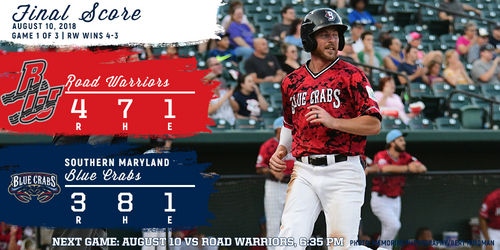 (Waldorf, MD., Aug. 10, 2018) - The Southern Maryland Blue Crabs (9-19) drop the series opener against the Road Warriors (5-24) 4-3. The offense got going early in the game, with the Road Warriors putting three runs on the board in the first. After a strikeout started the night for Casey Delgado (4-8), he then issued a walk to Daniel Aldrich and a single to Jorge Fernandez. Jose Ruiz would add another single, scoring Aldrich for the opening run of the night. Another walk would load the bases, setting up a sacrifice fly from Gustavo Pierre to score Fernandez. Edwin Gomez would follow that with a single, scoring Ruiz for the final run in the inning. The Southern Maryland offense bounced back right away, putting up two in the bottom half of the inning. Ryan Strausborger drew a four-pitch walk to start the frame, moving up to second on a single to center field from Edwin Garcia. An error at shortstop off the bat of Devon Rodriguez loaded the bases, before Raul Rivera (4-11) picked up a strikeout for the first out of his night. Frank Martinez would pull a single through the right side to score Strausborger and Garcia. Rivera would walk Cory Vaughn two batters later to load the bases but got a fielder’s choice to escape maintaining his 3-2 lead. The Blue Crabs would tie things up in the second inning when a double from Rodriguez scored Strausborger from first. The tie game wouldn’t last long, as the Road Warriors retook their one-run lead in the top of the third. Delgado would walk the first three batters in the inning to load the bases with still nobody out. Pierre would come through with a sacrifice fly once again, scoring Fernandez from third to give his team a 4-3 advantage. Delgado settled down to allow just one hit over the next two innings, before finding some trouble in the sixth. A pair of singles started the inning, with a sacrifice bunt moving both runners to scoring position. After a popup put a second out on the board, Jason Creasy was brought on to finish the inning. The hard-throwing reliever struck out the only batter he faced, stranding both runners to hold the deficit at one. Rivera settled down on the other side for the Road Warriors as well, as he retired the final nine batters he faced. The righty went six innings, allowing just the three runs to post a quality start and hand things off to his bullpen as well. Luis Cruz was first on in relief, as the southpaw worked two scoreless innings allowing just one hit. Closer Andrew Johnston (S,10) was brought on for the bottom of the ninth, looking to finish off the series opener. After two quick flyouts started the inning, an infield single from pinch-hitter Teodoro Martinez extended things back to the top of the order. Johnston recovered to get a groundout from Strausborger that led to a fielder’s choice, finishing off the 4-3 win for the Road Warriors. The Blue Crabs return to action Saturday, August 11th for the second game of the series against the Road Warriors. First pitch is scheduled for 6:35 P.M. on Saturday at Regency Furniture Stadium.